The fourth quarter of 2018 had some unfortunate similarities to the financial crisis of 2008 subsequent to the bankruptcy of Lehman Brothers. The Russell 2000, a broad-based equity index of U.S. small capitalization businesses, fell just over 20% in this period. As we approached the latter part of December, the trading environment had what I like to call a “get me out” feel, where fear was palpable and anything and everything was sold regardless of price. Volatility, as measured by the VIX, spiked over 30, a threshold usually associated with market panic, just before Christmas. By the end of the year there was virtually no place on the globe for investors to hide, other than cash and short Treasury bills. Even by mid-November, before the havoc had reached its crescendo, an astounding 90% of the 70 asset classes tracked by Deutsche Bank were negative year-to-date. The synchronized downward spiral broke the previous record set in 1920, when 84% of asset classes posted negative returns, and stood in sharp contrast to 2017, when just 1% of asset classes were in the red. If you’ll recall, 2018 started out with a painful bout of volatility, which caused convulsions in “short-vol” strategies – bets that volatility would remain at historic lows – that had boomed in popularity during the ultra-calm days of 2017. Apart from a few financial products that were forced to liquidate within a few days during “Volmageddon,” the U.S. markets shook off the unpleasant episode and resumed climbing until late September, when “risk-off” again became the prevailing attitude. This latest cluster of volatility, as is often the case, presents investors such as yours truly with an opportunity to distinguish between the price and the value of a security. They are not the same, and we are always interested when the latter is considerably higher than the former. We like to look at periods such as these as an opportunity to restock with higher-quality businesses trading at large discounts to private market value, which is why we have been opportunistic buyers over the last few months. Our intent is to be positioned well for the next up cycle, whenever that occurs. We believe some of what hurt us this quarter and calendar year in the Intrepid Capital Fund (the “Fund”) was our desire, as always, not to hug our benchmarks, in an effort to shield shareholders from inevitable severe drawdowns (30-50%) that occur every so often in the equity indexes. I had hoped our attempts to diversify away from the richly valued companies in the S&P 500 would work better than they did. Please keep in mind the Fund was down 11.42% for the quarter ending December 31, 2018. The Blended Benchmark consisting of 60% S&P 500 Index and 40% ICE BofAML High Yield Index declined 9.98%, the S&P 500 Index declined 13.52% and the Russell 2000 Index declined 20.20% for the same period. I and others at Intrepid have consistently voiced concerns about the easy money policies of central banks for most of the last decade and the distorted economic incentives created by their collective rate suppression activity. I think we are finally beginning to see the ripple effects of the toxic brew of artificially high prices supported by not only the Federal Reserve in the U.S., but the European Central Bank and Bank of Japan as well. The Federal Reserve has moved from quantitative easing (QE) to Quantitative Tightening (QT) with four quarter point (0.25%) adjustments in the Fed Funds Rate in 2018. As I have argued in prior communications, if the objective of QE was to support the prices of financial assets, then QT, while not the exact opposite mechanically, must nonetheless create a headwind for asset prices. Add in a potential trade war with China, a change of control in the U.S. House of Representatives, and lest we forget, those timely presidential tweets, and you have a recipe for a high degree of investor uncertainty, something financial markets have historically loathed. My job, as I see it, is to try to keep a steady hand on the tiller and, in the words of Rudyard Kipling, not lose my head when all about me are losing theirs. The Martina Navratilova quote is appropriate to this situation. My goal continues to be to keep the equity, fixed income, and cash allocation at levels I believe are appropriate to deliver attractive long-term risk-adjusted results. As of December 31, 2018, the portfolio was 54.9% equity, 39.6% fixed income and 5.5% cash. In light of the difficult fourth quarter capping off a negative return year for both Intrepid and all the major indices, I will start by discussing the detractors to performance; or as I call them with tongue firmly planted in cheek, the “seemed like a good idea at the time” bucket. The portfolio’s largest detractors for the quarter ended December 31, 2018 include Net1 UEPS (ticker: UEPS), Protective Insurance (ticker: PTVCB), and Royal Mail (ticker: RMG LN). The portfolio’s primary contributors for the same period were Dollar Tree (ticker: DLTR), Teradata (ticker: TDC), and Bemis 6.8% bonds due in 2019. In November, Net1 UEPS reported 1st quarter earnings that drove the stock down precipitously. As expected, the company’s contract with the South African Social Security Agency (SASSA) was successfully terminated at the end of September but the losses from the legacy cost structure of the SASSA contract ate into profitability more than was expected and spooked investors. These losses were made worse by an ongoing legal dispute with the government over how much UEPS should be paid for the final contract extension. Despite the messiness of the transition period Net1 finds itself in and the accompanying first quarter hiccup, we remain bullish on the company. Royal Mail’s shares cratered by 25% in the first two days of the fourth quarter after the company issued a profit warning. Management had reaffirmed their outlook and guidance for the year in July, but the expected productivity improvements that were supposed to boost the bottom line came in significantly below target. The shortfall was a result of residual effects from a labor union dispute earlier in the year and delayed implementation of several cost saving projects, and it had an outsized effect on profitability because of the company’s high operating leverage. On the positive side, Royal Mail still generates high amounts of cash and has the best delivery network in the UK, along with a shrinking reliance on letter volumes, which are in secular decline. We still believe the shares are undervalued despite the economic risks facing the business. Despite the general sense of gloominess in the financial world, there were several positive developments at Intrepid during the quarter that I would like to highlight. 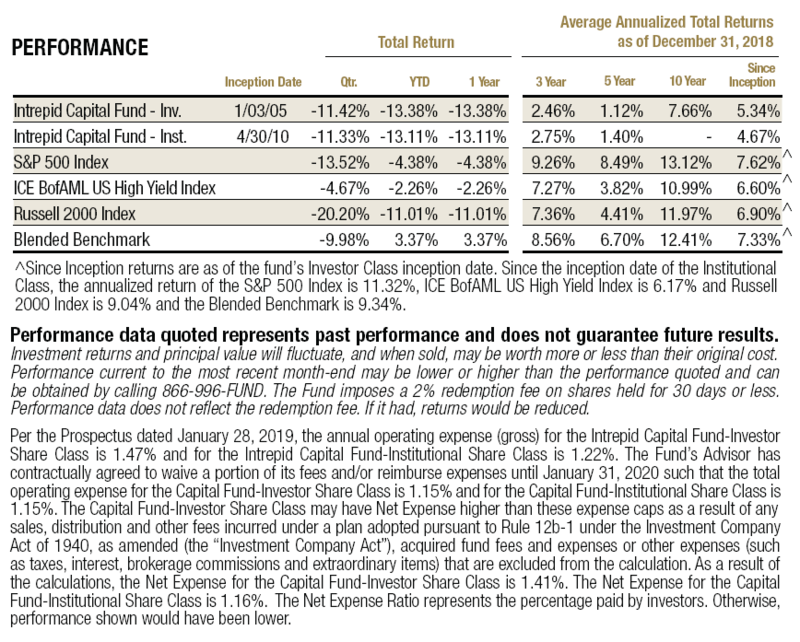 Our fixed income strategy, as well as the bond holdings in the Fund, performed admirably for both the quarter and the year as our focus on short-duration, high-quality corporate debt paid off as rates rose, credit spreads widened, and investment grade and high yield bond markets fell late in the year. There was no magic bullet to fully insulate investors from the widespread selling of the last few months, but we believe our recent results, in a small way, validate our defensive positioning. The other silver lining is that we’ve finally started seeing opportunities to put cash to work, which we’ve said for several years that we would do if valuations became more reasonable. 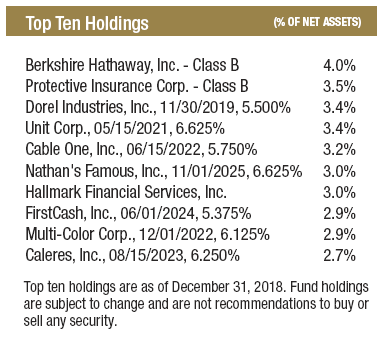 Most of our strategies were net buyers in the fourth quarter, and we have added a combined nine new holdings firmwide as companies we’ve been following became attractively priced. If we see more volatility in 2019, I expect this trend to continue, and I am confident that we have a talented and capable team in place to continue turning over rocks in search of undervalued names. Speaking of the team, we celebrated the addition, or rather readdition, of Joe Van Cavage, CFA to the “Intrepid brain trust,” as I like to call our investment team. Joe worked with us briefly as an analyst in 2010 and rejoined the team in December. He will serve alongside Matt Parker, CFA, CPA in managing the day-to-day operations of the Endurance Fund and has already contributed meaningfully to our collective research efforts. I am never happy to convey disappointing performance results. However, to earn the higher returns historically offered by the equity markets, we believe investors must endure the drawdowns in prices that occur from time to time, often without a known catalyst. Financial markets are fickle creatures in the short run, and while this past year has not played to our benefit, I have the utmost confidence that buying businesses at a discount to their fair value will continue to be a viable and rewarding investment strategy in the long run. We believe our risk-conscious, valuation-driven process is appropriate for long-term pools of capital. Otani, Akane & Wursthorn, Michael. “No Refuge for Investors as 2018 Rout Sends Stocks, Bonds, Oil Lower.” Wall Street Journal. 25 Nov. 2018. All investments involve risk. Principal loss is possible. The Fund is subject to special risks including volatility due to investments in smaller companies, which involve additional risks such as limited liquidity and greater volatility. Investments in debt securities typically decrease in value when interest rates rise. This risk is usually greater for longer-term debt securities. Investments by the Fund in lower-rated and non-rated securities present a greater risk of loss to principal and interest than higher-rated securities. The Fund may invest in foreign securities which involve greater volatility and political, economic and currency risks and differences in accounting methods. The risks of owning ETFs generally reflect the risks of owning the underlying securities they are designed to track. ETFs also have management fees that increase their costs versus the costs of owning the underlying securities directly. The S&P 500 Index is a broad-based, unmanaged index of 500 stocks, which is widely recognized as representative of the equity market in general. ICE BofAML U.S. Corporate Index is an unmanaged index of U.S. dollar denominated investment grade corporate debt securities publicly issued in the U.S. domestic market with at least one year remaining term to final maturity. The ICE BofAML US High Yield Index tracks the performance of US dollar denominated below investment grade corporate debt publicly issued in the US domestic market. Qualifying securities must have a below investment grade rating (based on an average of Moody’s, S&P and Fitch), at least 18 months to final maturity at the time of issuance, at least one year remaining term to final maturity as of the rebalancing date, a fixed coupon schedule and a minimum amount outstanding of $250 million. The Russell 2000 Index consists of the smallest 2,000 companies in a group of 3,000 U.S. companies in the Russell 3000 Index, as ranked by market capitalization. The Blended Benchmark consists of 60% S&P 500 Index and 40% ICE BofAML US High Yield Index. Bloomberg Barclays Capital U.S. Aggregate Bond Index is an index representing about 8,200 fixed income securities. To be included in the index, bonds must be rated investment grade by Moody’s and S&P. CBOE Volatility Index (VIX) reflects a market estimate of future volatility, based on the weighted average of the implied volatilities for a wide range of strikes. It is used to gauge the market’s anxiety level. You cannot invest directly in an index. Tangible Book Value is is the total net asset value of a company (book value) minus intangible assets and goodwill.